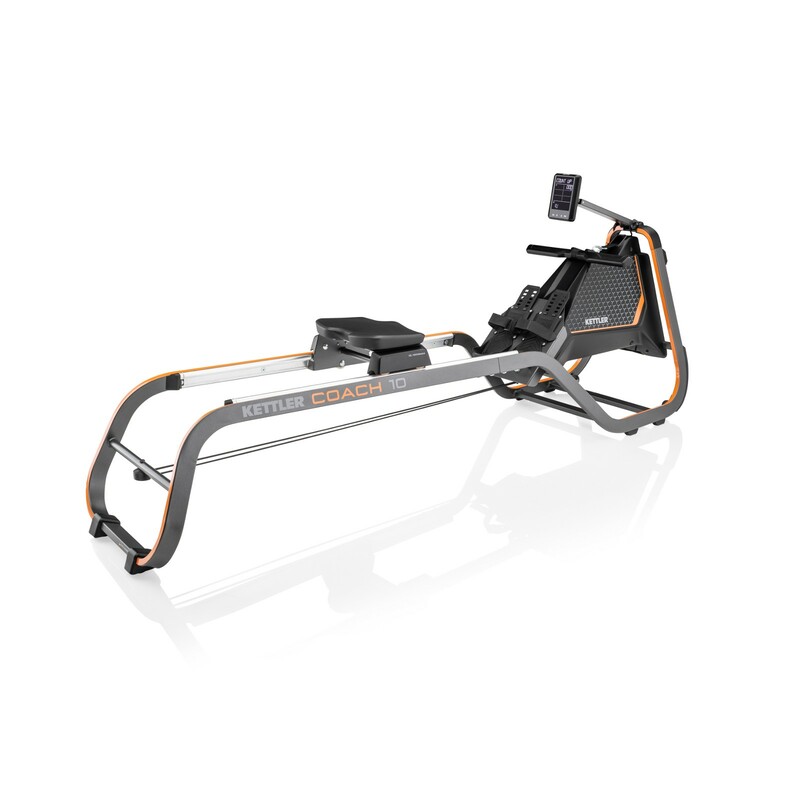 The new Kettler Coach 10 is the strongest performing rowing machine from the new Coach series. Built with a very quiet and maintenance-free induction brake, you can adjust the resistance between 10 levels from 25 to 600Watts. This large range makes the rowing machine suitable for training beginners as well as for hobby athletes and rowing professionals. Certified for use in gyms it is built to widthstand continuous use and intensive workouts. An interesting detail is the changeable grips, with the two multi-move-grips athletes can train more intensively. The grey finish of the aluminium frame with orange accents gives the Coach 10 a modern and appealing design. The long double rails, induction resistance system, high seating position and other details give the Coach 10 high ergonomics and is satisfyingly comfortable. Thanks to the long sliding rails taller users, around 2m, can use the rower without any problems. Over the integrated Bluetooth receiver you can connect your smartphone, tablet, sport watch or chest strap to the rower. One advantage being while connecting your sport watch with a chest strap (optionally available) you are able to read your heart rate on your wrist or on the LCD display of the rower. So that you can train in the optimal heart rate zone and plan your training to be especially effective.